Which Are The Top Home Security Camera Systems? Surveillance systems are very important, and they will receive proper attention in this article. Each one of these systems are available right now on Amazon.com. We have have chosen 5 out of many, that are our top favorites. Here at Surveillance Reviews we are all about giving you the best home surveillance systems reviews possible. So out of the 5 systems below we will boil it down to 1 which we think is the best. So join us as we try to find out what are the 5 top home security camera systems available right now. 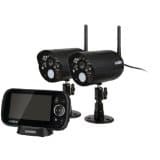 The Night Vision Cameras PKD-DK4216-500GB by Zmodo will allow you to see anything that is happening in your home or office at any time, as you will be able to access the videos via the Internet. – Huge, pre-installed hard drive (500GB). – Zviewer app. This app allows you to see your videos via your smartphone. Users have complained that there are missing parts in the packaging. Something to keep an eye out on, but overall a nice system for first time security camera users for a great price. 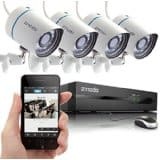 The Security Cameras 1TB HDD 4CH 720P PoE by Zmodo is very easy to set up, and its 4 outdoor cameras will allow you to see everything inside and around your home or office. – Remote, quick access via smartphone. – Delivers video and power through just one cable. – Cameras come with waterproof housing. – 720 HD real time video. Users have complained that the cameras start to fail gradually over time. The PKD-DK0855-500GB 8-Channel Cameras by Zmodo will allow you to view anything happening at home or in the office in real time. – Huge hard drive installed (500GB). – View foots on many screens. Making the system work on mobile devices may be a bit complicated. The QT5682-8E3-1 8-Channel 960H Security Cameras by Q-See is the solution that brings peace of mind to your office or home. – Huge hard drive (1TB). – Stream video directly to your smartphone. The system has been reported to randomly malfunction for no apparent reason. The UDR444 Guardian 4.3-Inch Surveillance Cameras by Uniden is the right system to keep your office or home secure for more time in the wettest and darkest conditions you can imagine. – You can expand your view by adding cameras. – Since the cameras are paired to the useseful monitor from the very beginning of the installation process, you will be able to install this surveillance system in no time. – Power will last for up to 4 hours as this system comes with a rechargable battery. In addition to this, you will save energy as this machine comes with auto power-save mode. – Cameras tend to be a bit fragile and easily breakable if not handled carefully. – The owner’s manual might be a bit complicated to follow. 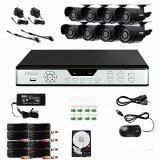 Here at Surveillance Reviews.net we choose the Security Cameras 1TB HDD 4CH 720P PoE by Zmodo not only for it’s great price, but also it’s great day/night video quality, excellent starting hard drive space, and the fact that power and video is delivered with only one cable, among other features. This camera system would be a great system to use for both home and office. If you want to protect your home and reduce the risk of theft, you can’t go wrong installing the cameras mentioned in the surveillance systems reviews above, at home or in your office. 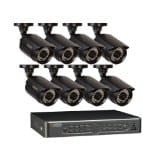 Not only are these systems dependable, long-lasting, and will definitely provide that extra bit of security that you are looking for.